I'm really fond of this project, probably because I spent almost one and a half months working on it. I had noticed there weren't a lot of 1on1, 2on2 or similar small maps, so I wanted to create one since it could help hosts to fill an empty server. I started off by mapping a sandy rectangle, putting up a fence and forming hills around it. 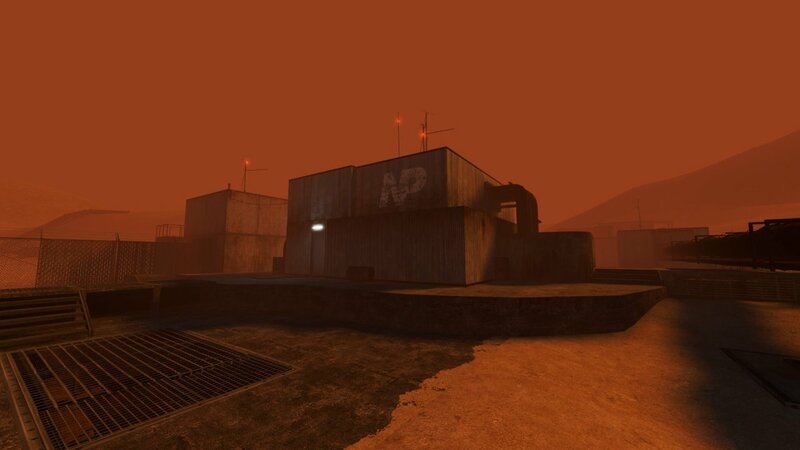 The Idea at that time was to create a map that borrowed its style from Call of Duty 6's DM_Rust. Since base source doesn't have a lot of props one could use in that setting, I decided to change it from "Rust thingy in the desert to "Oil Derrick with some containers". Having brushed out a concept for an oil derrick, I couldn't imagine how to go on from there. I had no idea how to create good models at the time, so that setting also had to be dropped. Still lacking directions, I just continued mapping out the gameplay and thought I'd come up with something good along the way. I didn't, but the very first attempt at texturing with random metal textures from de_port looked surprisingly fitting, so I just decided to stick with it. The setting is now something along the lines of "water pumping hub station in a desert", which gives the multiple pipes an actual purpose and allows the map to have a void and suffering atmosphere since it's about terrorists shutting down water supplies. The latest update was released on april 16th 2011. It included bugfixes and optimizations in framerates and file size.